If you are new to ECGclass - Welcome! A 36 yrs old lady presents to you with a history of ‘blackouts’. You assume these are some sort of vaso-vagal attack and ask about her menses, her alcohol habits and any other history but she shares no helpful relevations. Examination is entirely normal, as are her FBC and electrolytes. Does the explanation for her blackouts, lie in her abnormal ECG obtained below? 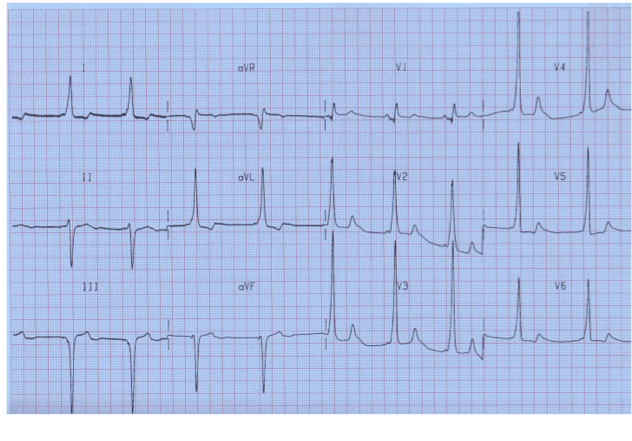 The ECG shows the ‘delta wave’ of Wolf Parkinson White (WPW) Syndrome. This may not always be seen and can appear intermittently on different ECG’s on the same patient. It is often associated with a short PR interval (<3 small squares, <0.12sec). Thus, it is one of a group of conditions referred to as “pre-excitation” syndromes. WPW is the commonest form of Atrio-Ventricular Re-entrant tachycardias (AVRT). Between 1.5 - 3 per 1000 population have the ECG signs of WPW. In one-third the ECG finding may be detected incidentally. WPW in commoner in younger adults (age related fibrosis reduces its incidence). The pre-excitation is caused by the presence of an abnormal accessory conduction pathway between the atria and ventricles. This pathway is called ‘The Bundle of Kent’. Impulses which travel down this pathway, will cause the ventricles to contract prematurely. It is this premature contraction of the ventricles, which give rise to the short PR interval and the delta wave. In turn this can give rise to a supraventricular tachycardia, or more specifically, an AVRT. HOWEVER, the ECG finding alone does not constitute the ‘syndrome’. To be truly diagnostic, there needs to be a history of syncope/palpitations as a result of episodes of Paroxysmal tachycardia. Given that this lady has been having symptoms, it would be safest to assume these are as a result of her WPW. She should be referred urgently to an electrophysiologist cardiologist for risk stratification and further management. · A 24hr ECG will be useful to look for runs of VT.
· An exercise ECG helps stratify risk – if the delta waves vanish at higher heart rates, the prognosis is better. (ie. There is reduced risk of fatal tachycardia if the aberrant pathway doesn’t conduct at higher rates). Well done if you recognized the delta waves – or the short PR interval! Thanks to all who took part this evening. (Please use the hashtag #ECGclass if you are joining and it always helps if we introduce ourselves).